On 15 April 2012, to commemorate the 100th Anniversary of his birth (born on the exact same day and year the R.M.S. 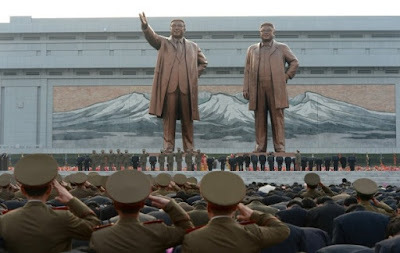 Titanic sunk), statues of Kim Il-sung and his successor-son, Kim Jong-il were unveiled with great ceremony and celebration. It's interesting to look at these statues from a body language point-of-view. Kim Il-sung (his likeness on our left), the father - has his feet slightly further apart than his son. This wider stance signifies confidence and his being slightly more so, also dominance over his son, Kim Jong-il. The designer/scupturer should have widened their stance a bit more however (slightly more than shoulder's width for the father and the son slightly less) - if indeed the goal was to demonstrate alpha dominance to the rest of the World. 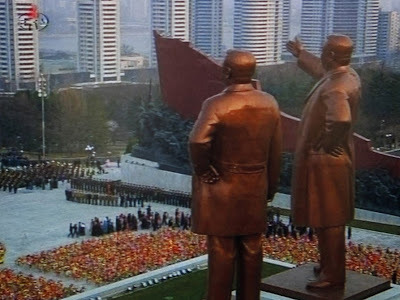 Kim Il-sung's right hand is oriented palm-in, and perpendicular to the ground. Had his hand been palm-down with an out-stretched arm, this would have been very close to the Nazi salute. While pointing with the whole hand is much more refined and fostering than pointing with a single finger - the North Koreans would have been better advised to have Il-sung's hand oriented palm up, fingers slightly curled and loose, with his elbow bent about 20 degrees. Such a nonverbal cluster would have been a better blend of alpha-beta as well as confidence/assertiveness. This would have "softened" his posture significantly, while looking more like a benevolent leader. The left arm of both Kim Il-sung and Kim Jong-il are each posed in variations of "Arms-Akimbo". Both are rather beta versions though. Il-sung's thumbs-forward-akimbo sends nonverbal messages of support and nurturing. Hugh Grant is an actor who often uses this thumbs-forward variant to engender these feelings. The most common place you'll see this though is on the playground - with the mothers (and some fathers) looking after their young children. Kim Jong-il's left hand arms akimbo is perhaps the least common permutation. His open palm is faced outward with the back (dorsal) aspect of his wrist making contact with his hip. This is somewhat effeminate and also common in the elderly as people with weak or painful backs are often seen in displaying this nonverbal. It also can be seen in the lackadaisically minded. This is certainly not a body language signal which exemplifies strength. Both former North Korean leaders' akimbo oriented arms are situated posterior (in back of) to the plane of their torsos. This is also a modification which makes akimboed arms more beta and less alpha. If I were repositioning each of their arms, I would have placed Kim Jong-il's clasped loosely behind his back (palm-to-open palm). Kim Il-sung's left arm I would have placed in arms-akimbo - only instead the thumbs backward variety and with the plane of his arm oriented within the plane of his torso (see above for a more desirable position of Il-sung's right arm). Yet another variation would be perhaps to have the younger Kim with his right hand raised up to his eyebrows, shielding the sun's rays and looking to where his father was pointing. His current pose suggests a bit of apathy. Any of these variations would have been more confident and more alpha than what we see exampled in these images. Another message sent here is the closed-off nature of their clothing. When taking into account local and temporal fashion trends, it is well documented that dictatorial rulers rarely reveal their upper, central chest (manubrial area, just beneath the base of the neck) and have tight collared shirts and jackets. This tight-necked, closed-off clothing mirrors their closed societies over which they rule. These visual metaphors were made at much expense, and sending signals for which their designers didn't remotely intend.